Summary. This pictogram is ETC instruction about dematerialization of humanity from the level of Crystal structures and the Transition to other safe level of the material world due to beginning of global cataclysms soon. ETC underline the importance of spread information about the necessity of the civilization’ united consciousness formation for the dematerialization and the Transition widely. ETC warn that otherwise the civilization of Earth will be destroyed. The pictogram shows four groups of people who unite their consciousness. However, to two groups, depicted by the top and bottom circles, only small quantity of people has joined. These people are not able to cause dematerialization. They will be lost in global cataclysms of the planet destruction. Two other groups constantly grew and expanded, until they formed the unified consciousness of humanity. The united consciousness of civilization will cause an action of incredible power which will transform our bodies. 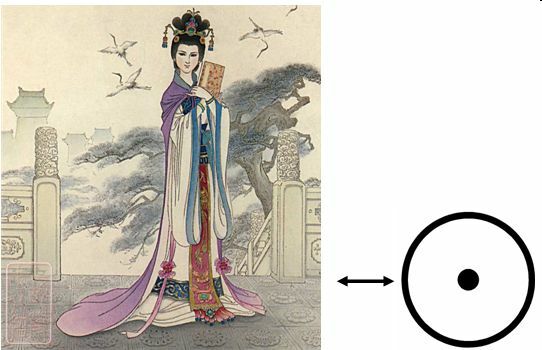 Therefore these two circles are combined by a symbol of dematerialization. 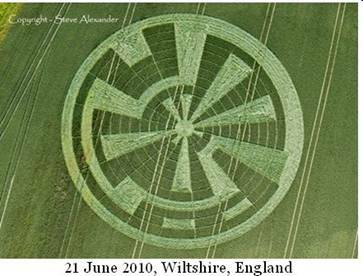 The pictogram continues a theme begun in crop circle on 21 June 2010, Wiltshire, England about level of consciousness of earth dwellers and a wide spreading of the information about the necessity of the civilization’ united consciousness formation. This necessity is based on soon beginning of global cataclysms. ETC warn that it is necessary to leave immediately the level of the Crystal structures where we live now and to make the Transition to the Highest level of the material world where a new life cycle will begin. On the pictogram four light circles of a small diameter are shown. It is brain areas of individual cells (fig. 1, red arrows). They specify on the fourth level of mankind consciousness, i.e. individual. Borders of all these cells are circles with the biggest diameter (fig. 1, yellow circles). They are shown only on two circles. In all their messages ETC inform about the necessity to generate the united consciousness of the civilization because the united consciousness possesses an action. This action will transform our body and, thereby, will allow making the Transition to other safe level of the material world with no cataclysms. However, the ETC show that not every unified consciousness has the same power of an action. Thus, a small group of people will cause only a weak action of the united consciousness. This action can not transform our bodies. Strong action capable to transform our body can cause only a huge group of people - an entire civilization. This information just transmits this pictogram by many circles and pointed oval of dematerialization. Let’s consider how ETC transfer this information through symbols of consciousness. Expansion of a brain area, caused by consciousness association, shows all four circles (fig. 1, red arrows). However, two circles located from top and bottom show only a small expansion of the brain area - just only on one circle (fig. 2 and fig. 3, blue arrows). It indicates that the unified consciousness is formed only by a few people. ETC show that this united consciousness causes a very weak action. This action does not have sufficient power to transform our body in order to make dematerialization. That is why these circles are as if empty – they do not have the symbol of dematerialization and they are far away from each other. Near the upper circles a small circle is shown (fig. 3, red arrows). It is a brain area of an individual cell. This circle is given for comparison. Thus, it is shown that this cell is the united consciousness cell (in this case!). Two circles with increasing diameters show that the cell has expanded a brain area by increasing number of people joining to the united consciousness of the initial group (fig. 3, blue arrows). On the other hand, two circles, which centers are located horizontally, have a huge expansion of a brain area which is shown by five circles (fig. 4). We already noted that number «five» presents the level of the united consciousness. Thereby, ETC once again underline that these circles of expansion, correspond to the united consciousness. Many circles specify that the initial group of people, who have united consciousness, constantly extends due to newcomers (fig. 4, dark blue arrows). 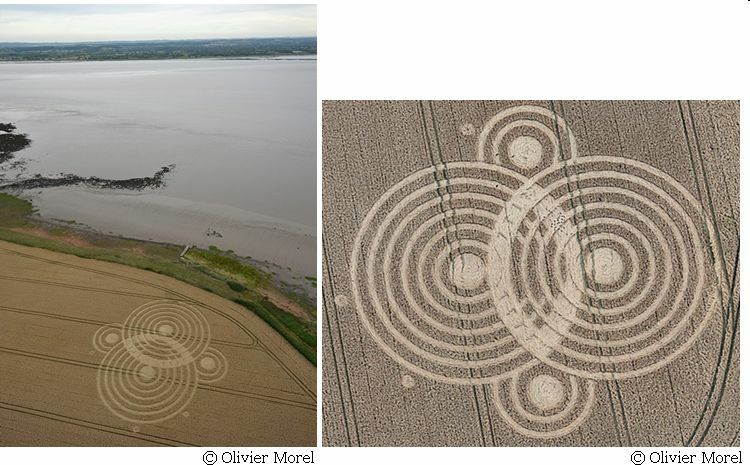 By five expanding circles ETC show the united consciousness of civilization. Just these two cells representing the united consciousness of civilization, will cause the united consciousness action capable to transform our bodies for dematerialization. This symbol of dematerialization - a pointed oval is shown between these two circles (fig. 5). Let's show schematically how this pointed oval of dematerialization is formed. When two people communicate, it means that they unite consciousness. At the information level of the Universe, this process is displayed by two individual cells with areas of a brain shifted to borders. Let’s consider the information transmitted directly by a pointed oval of dematerialization. First of all, ETC show that it will be not easy to form the united consciousness of humanity. They show it by wide cells’ borders (fig. 6). Our cell’ borders are so wide (fig. 6, red arrows), that on their thickness ETC present even crossing of each level of consciousness expansion (fig. 6 and fig. 7 blue arrows). On both sides of a pointed oval of dematerialization are shown three diamonds (fig. 8). Quadrilateral diamonds represent the fourth level of human consciousness, and the number three - quantity of previous levels of consciousness, which are included in human’ cell. Hence, this combination of symbols tells that through the united consciousness together with us on the Highest level of the material world will also transfer three previous levels of consciousness – inorganic and organic nature. 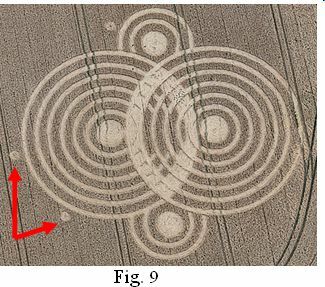 Near the big circle two small circles are depicted (fig. 9, red arrows). They show the principle of the united consciousness formation due to which were formed so many expanding circles. This principle is the following: at association of two individual cells with small brain’ areas one united cell with the expanded brain’ area is formed. This expansion shows five circles through increasing of diameter. Some researchers note that this pictogram is placed practically opposite the aging Olbury Nuclear Power Station which lies on the opposite bank of the River Severn. So, between this pictogram and Olbury Nuclear Power is water. Thus ETC warn about location of this Nuclear Power Station near the river that will be very dangerous during first preliminary cataclysm. This ETC’ pictogram warns that the small quantity of people will not be able to cause our dematerialization from the level of global cataclysms. Only the united consciousness of all civilization will make a dematerialization and the Transition for continuation of our life. ETC symbol of dematerialization – pointed oval (green color) is presented in the center of this pictogram. A pointed oval of dematerialization is a result of overlapping of two brain areas of individual cells. This pictogram show that we can make dematerialization only through the united consciousness formation. ETC warn that otherwise the civilization of Earth will be destroyed. For us dematerialization is stunning possibility described in fantasy novels and Hollywood movies. But ETC masters of teleportation, constantly use dematerialization for inter-galaxies flights in the universe. Our Transition is the first stage for teleportation. ETC give us instructions for our first Transition to the next cycle of life. ETC present unknown fascinating opportunities of human’s consciousness allowing dematerializing from the level of Crystal structures. So, we can transfer to other parallel level of the material world. Dematerialization opens a new era of flights in the universe. The necessity of dematerialization is connected with beginning of global cataclysms in nearest future. 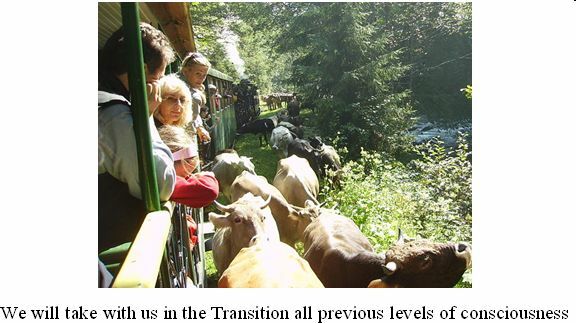 ETC confirm that this Transition is the only way to prolong our life. Our Transition will not affect anybody’ private property.